for the two little banners. 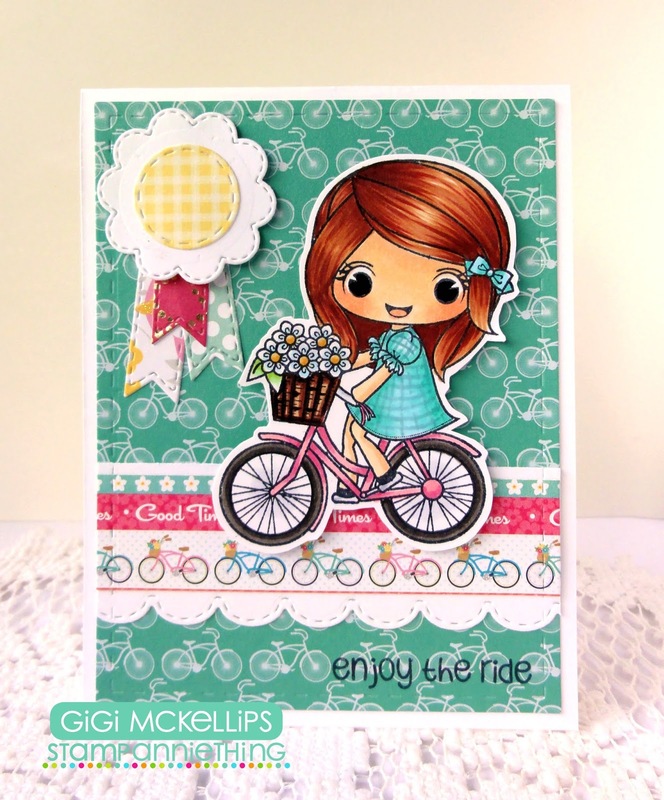 I used the Julie-Enjoy The Ride stamp set to create my card. I created the center strip with the Border Dies and a piece of decorative paper. I stamped and colored Julie with Copic markers, adding her on pop dots, and stamped the sentiment. I created the flower with the Spring Dies and added the banners cut with the Mini Tag Dies 2. Its Stephen from Stampin' Steve and I am popping by to share another card creation with you today. I have been really into clean and simple cards lately. I just love the aesthetic of a card with lots of white space and a limited color pallet...I think its not only pleasing to the eye but also lets the image really pop. This card was really fast and fun to put together and is also the perfect card to send off to a friend if you want to send a quick note. I wanted to keep the color pallet small, so I only used Oranges, Yellows, and Reds. For an extra pop of colour and to help bring your attention to the stamped image, I added a nice rich blue color. The background was created by doing simple ink blending using Distress Oxides in the colours of - Mustard Seed, Spiced Marmalade, and Barn Door. I then splatted some water on it to get the water droplet effect. I cut the bottom on a diagonal for some visual interest and then matted it on the same white cardstock as my card base. I hope you liked my card creation for today! When Stamp? how did you first get into crafts (general)? I stated 6?7? years ago in I like carving rubber stamp and stamped with my own stamp. When Stamp; how did you first get into card making specifically? I started going to stamp shop class to learn for card making using company stamps.And my first design team is The Ton stamps. What is it that you enjoy about card making? I enjoy the creative a story and coloring with anythings.Specially use a watercolor paint and color pencil. Do you give your finished cards away or do you keep them for yourself or do you sell them? If you sell them, where can we find them? I give my finished cards to friends and family for occasions/holidays and donation. What is your style of card making? My style is many details.How do you think? 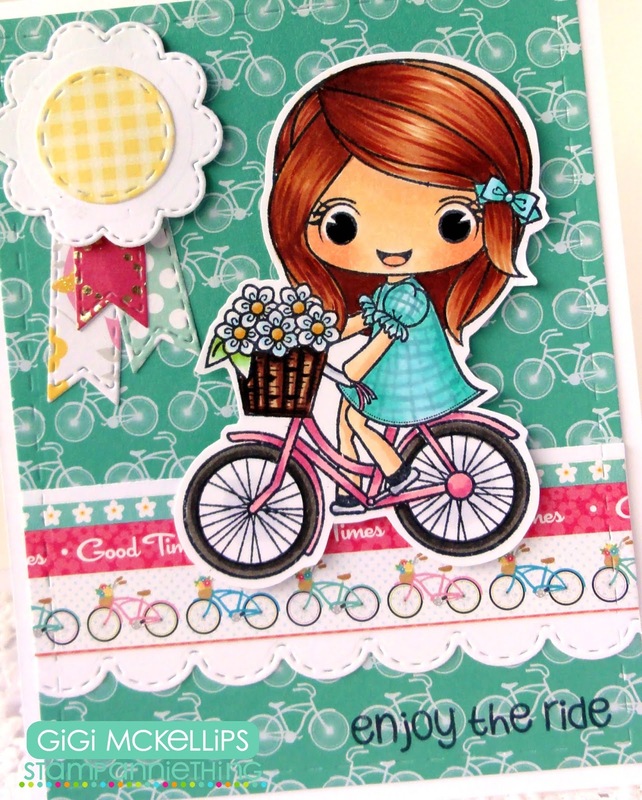 What is your favorite media to use in card making? Watercolor paint and color pencil, drawing ink, sequis, die. Besides card making, what other crafting do you do and enjoy? I love making using my own stamp and making with stamp for story like children book image. Aside from crafting, what other hobbies and things are of interest to you? How did you learn to color? Did you take classes, watch videos or are you self-taught? I leared on academy.This academy is for go tp art school. After that I’ve just been practicing myself. What is your favorite thing to color? What is your process in designing a card? I start with my image, pick out color and layout. Do you have any “fail safe” tips you can share? Making a lot of cards or sketch before starting. What advice would you have to someone just starting out coloring images or card making? Practice and searching many card making another ppls.It is important to see a lot of cards. Tell me something that I may not know about you. I love drawing a flowers and I sell my digital stamp on Etsy and my job is Designer. I love our stamps because so cute and unique all things.Try our products for your card or anythings. What is the ONE crafting tool you find to be a MUST for your crafting arsenal? Vellume paper and sequins and Distress ink. 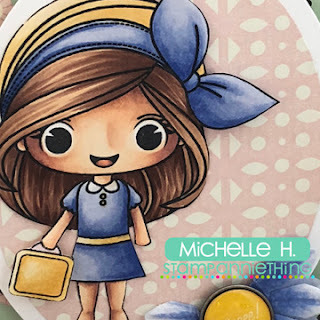 I started stamping the lemonade girl image stamp on maker paper. And colored with our new die-cut image and lemonade image stamp then fussy cut. Added the lemonade girl, many lemonade theme image paper piece on card panel with foam tape on A6 size card stock. And colored a shadow with a watercolor paint all around. Lastly added a sentiment paper. And please join our blog hop. You can see our awesome design team cards. I hope you enjoyed our Sneek Peek for the release! Hello there!! Nicole here today with a wedding inspired card to share with you. Hey Everyone! It's Candace from Candi O. Designs and it's my day to post over at Stamp Anniething. 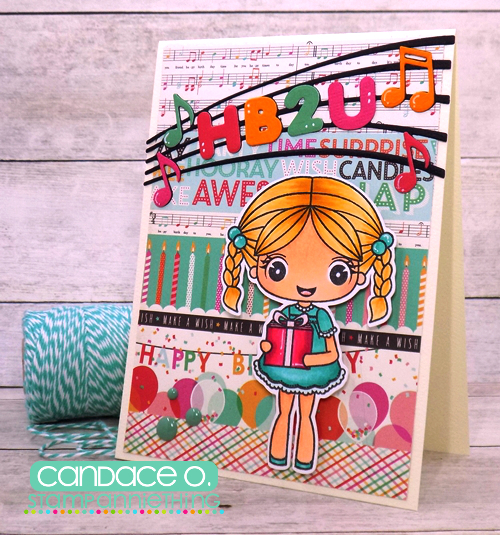 I created a birthday card using Lorelei - It's Your Day and the new HB2U Music Die ~ so fun!!! !